According to the 1911 census, John Lowe was born in Middleton-in-Teesdale. The 20-year-old was working as a labourer at the local coke ovens that time and seemed to be the main bread-winner in the family as his three siblings were still at school. His widowed mother took in two lodgers which probably helped her maintain the household. At the outbreak of war, John was quick to join up. This army service record shows that he attested on 9 September 1914 in Bishop Auckland. 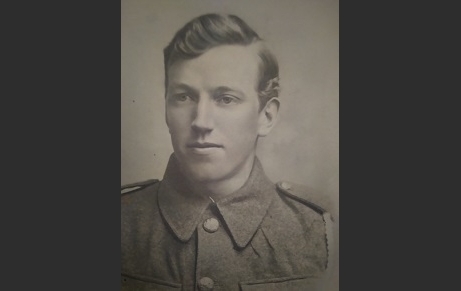 A year later he disembarked in France with the 14th Battalion Durham Light Infantry (DLI). His army service record shows that he was injured on a number of occasions, including in an accident that caused a court of inquiry to be held. The court of inquiry notes that are found in John’s service record show that he was part of a training exercise on 4 October 1916. The object of the exercise was to practice shooting rifle grenades, which, it is noted, were usually shot from “discarded or salvaged rifles”. The grenades being used were blanks, fortunately for John, because when he pulled the trigger, the rifle exploded. He was injured slightly in his right hand. The court of inquiry found that John was not to blame and that his injury had been an accident. Interestingly, a section of the notes from the court of inquiry have been scribbled out. This part seems to condemn the use of old rifles and suggests that their use for firing grenades should be discontinued. Perhaps this was not a sentiment that could be endorsed by the army. In spite of the accident, John Lowe was awarded the Military Medal in January 1917 and was subsequently promoted to lance corporal in May of that year. John Lowe died on the last day of The Battle of Cambrai. He has no known grave and is commemorated on the Cambrai Memorial at Louverval in France and on the War Memorial at Coundon.